Outage caused by a Hurricane near Guam, so no Bacodine transmitted. with an uncertainty of 3 arcmin (radius, 90% containment, including systematic uncertainty). with an uncertainty of 5 arcseconds (radius, 90% containment). This location is 39 arcseconds from the BAT onboard position, within the BAT error circle. Due to bad weather near Guam, we only have limited information about this burst at this time. More information will be available after a full ground station pass. Dec (J2000): +09d 59' 56.0"
We have analysed 6.1 ks of XRT data for GRB 160804A (Marshall et al. GCN Circ. 19761), from 137 s to 18.0 ks after the BAT trigger. The data comprise 600 s in Windowed Timing (WT) mode (the first 9 s were taken while Swift was slewing) with the remainder in Photon Counting (PC) mode. The enhanced XRT position for this burst was given by Osborne et al. (GCN Circ. 19762). The late-time light curve (from T0+4.3 ks) can be modelled with a power-law decay with a decay index of alpha=0.32 (+0.20, -0.19). A spectrum formed from the WT mode data can be fitted with an absorbed power-law with a photon spectral index	of 1.772 (+/-0.023). The best-fitting absorption column is 1.44 (+/-0.08) x 10^21 cm^-2, in excess of the Galactic value of 1.9 x 10^20 cm^-2 (Willingale et al. 2013). The PC mode spectrum has a photon index of 1.90 (+0.17, -0.16) and a best-fitting absorption column of 7.1 (+4.3, -3.8) x 10^20 cm^-2. The counts to observed (unabsorbed) 0.3-10 keV flux conversion factor deduced from this spectrum is 3.4 x 10^-11 (4.0 x 10^-11) erg cm^-2 count^-1. If the light curve continues to decay with a power-law decay index of 0.32, the count rate at T+24 hours will be 0.049 count s^-1, corresponding to an observed (unabsorbed) 0.3-10 keV flux of 1.7 x 10^-12 (1.9 x 10^-12) erg cm^-2 s^-1. The results of the XRT-team automatic analysis are available at http://www.swift.ac.uk/xrt_products/00707231. The Swift/UVOT began settled observations of the field of GRB 160804A 82=20 s after the BAT trigger (Marshall et al., GCN Circ. 19761). A fading source consistent with the XRT position (Osborne et al. GCN=20 Circ. 19762) is detected in the initial UVOT exposures. The magnitudes in the table are not corrected for the Galactic=20 extinction due to the reddening of E(B-V) =3D 0.03 in the direction of the burst (Schlegel et al. 1998). Dec(J2000) = +10d 00' 06.2"
with an uncertainty of 1.3 arcmin, (radius, sys+stat, 90% containment). The partial coding was 28%. The mask-weighted light curve shost several overlapping peaks starting at ~T+20sec (possibly at ~T-30 sec), peaking at ~T+90 sec, and returning to baseline at ~T+330 sec. T90 (15-350 keV) is 144.2 +- 19.2 sec (estimated error including systematics). The time-averaged spectrum from T+25.14 to T+247.15 sec is best fit by a power law with an exponential cutoff. This fit gives a photon index 1.40 +- 0.23, and Epeak of 52.7 +- 5.4 keV (chi squared 57.0 for 56 d.o.f.). For this model the total fluence in the 15-150 keV band is 1.14 +- 0.03 x 10^-5 erg/cm2 and the 1-sec peak flux measured from T+88.59 sec in the 15-150 keV band is 2.9 +- 0.3 ph/cm2/sec. A fit to a simple power law gives a photon index of 1.99 +- 0.05 (chi squared 79.05 for 57 d.o.f.). All the quoted errors are at the 90% confidence level. MASTER-SAAO robotic telescope (MASTER-Net: http://observ.pereplet.ru) located in SAAO was pointed to the GRB160804A (Swift trigger= 707231 came only from (Marshall et al., GCN19761) at 2016-08-04 17:59:48 UT (16h27m01s after the trigger time). We have set of images with unfiltered m_lim=20.7 (540s exposure). We see the Swift/UVOT source (Breeveld et al., GCN 19764) at Ra Dec (2000)=14:46:31.14 +09:59:56.7 with unfiltered m_OT~ 20.3. There is a Sloan galaxy in 0.182" with green g=21.7, red r=21.2m, i.e. possible host galaxy for this GRB. "At 01:34:16.04 UT on 04 August 2016, the Fermi Gamma-Ray Burst Monitor triggered and located GRB 160804A (trigger 491967260 / 160804065), which was also detected by the Swift-BAT (Marshall et al. 2016, GCN 19761). The GBM on-ground location is consistent with the Swift position. The angle from the Fermi LAT boresight at the GBM trigger time is 87 degrees. The GBM light curve consists of single emission episode with a duration (T90) of about 130 s (50-300 keV). The time-averaged spectrum from T0-60 s to T0+70 s is best fit by a power law function with an exponential high-energy cutoff. The power law index is -1.1 +/- 0.1 and the cutoff energy, parameterized as Epeak, is 74 +/- 3 keV. The event fluence (10-1000 keV) in this time interval is (1.5 +/- 0.3)E-05 erg/cm^2. The 1-sec peak photon flux measured starting from T0+10 s in the 10-1000 keV band is 4.6 +/- 0.3 ph/s/cm^2. We observed the field of GRB 160804A (Marshall et al., GCN 19761) with the Telescopio Nazionale Galileo (TNG) equipped with DOLoRes. Observations were carried out in the r and z filters. At the position of the optical afterglow (Breeveld & Marshall, GCN 19764), we clearly detect an extended object in both filters. Calibrating compared to nearby SDSS stars, we measure AB magnitudes r = 20.99 +- 0.04 and z = 19.99 +- 0.17. The mid time of the observations is Aug 4.89 UT, that is 0.83 days after the trigger. We note that this object is clearly visible in the SDSS frames, with catalog magnitudes of r = 21.22 +- 0.11 and z = 20.74 +- 0.35. It is classified as a galaxy with a (fairly uncertain) photometric redshift z <~ 0.5 This object is most likely the host galaxy of GRB 160804A. Our measurements are marginally (2 sigma) brighter than the SDSS values, though we caution that aperture effects on a low S/N extended object may be responsible for the difference. In any case, the afterglow is only contributing little flux at the epoch of the TNG observations. A. S. Moskvitin, T. A. Fatkhullin (SAO RAS, Russia) and I. Soloviev (Saint-Petersburg Univ. ), report on behalf of the larger team. 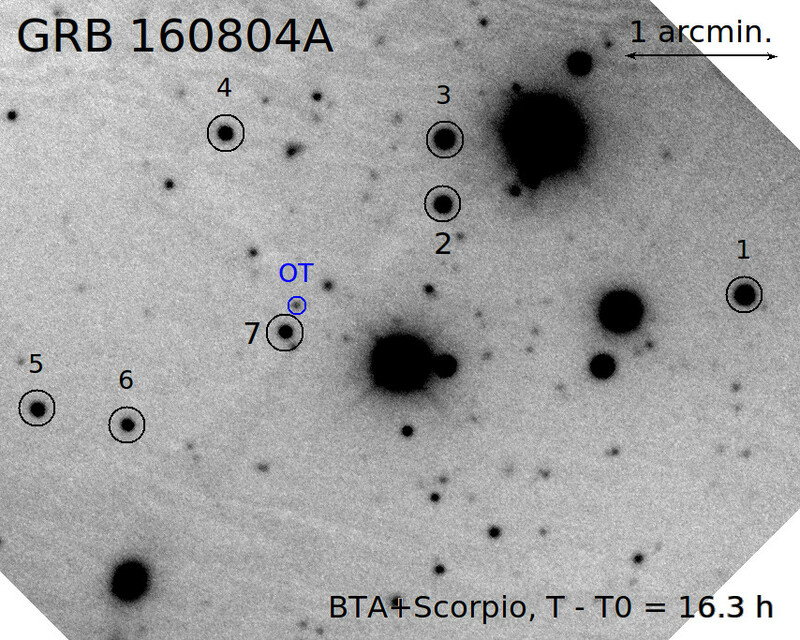 We observed the field of the GRB 160804A (Marshall et al., GCN 19761) with the BTA, 6-meter telescope of SAO RAS, equipped with the Scorpio-I at 2016.08.04 17:52 UT (16.3 hours after the detection). A couple of Rc-band images (30 and 180 sec.) were obtained. The GRB OT (Breeveld & Marshall, GCN 19764; Tyurina et al., GCN 19768) is clearly detected in the stacked frame. The brightness of the object is R = 20.5 +/- 0.1 (calibration was done by the nearby SDSS stars, and Lupton 2005 transformation equations). We observed the optical afterglow of GRB 160804A (Marshall et al., GCN 19761; Breeveld et al., GCN 19764) with the ESO VLT UT2 (Kueyen) equipped with the X-shooter spectrograph. Observations started at 23:55 UT on 2016-08-04 (22.37 hr after the BAT trigger) and consisted of 4 spectra by 600 s each, covering the wavelength range 3500-20000 AA. The continuum trace is well detected in our exposures, down to ~3100 AA. The lack of any drop sets an upper limit to the redshift z < 1.55. A number of superimposed absorption features are detected, which we interpret as due to Mg I, Mg II, Fe II, Al II, as well as emission features due to [O II], [O III], Halpha, Hbeta, Hgamma, [N II], [S II], [S III], all at a common redshift z = 0.736. We thus conclude this is the redshift of GRB 160804A. We acknowledge excellent support from the ESO observing staff in Paranal, in particular Jonathan Smoker, Leo Rivas, and Stephane Brillant. We observed the field of GRB 160804A (Swift trigger 707231; Marshall et al., GCN #19761) simultaneously in g'r'i'z'JHK with GROND (Greiner et al. 2008, PASP 120, 405) mounted at the 2.2m MPG telescope at the ESO La Silla Observatory (Chile). Observations started at 23:12:02 UT on 2016-08-04, 21.7 hr after the GRB trigger. They were performed at an average seeing of 1.3", at an average airmass of 1.5. We clearly detect the source reported by Breeveld et al. (GCN #19764), Tyurina et al. (GCN #19768), Malesani et al. (GCN #19770), Moskvitin et al. (GCN #19771) and Xu et al. (GCN #19773). Given magnitudes are calibrated against SDSS as well as 2MASS field stars and are not corrected for the expected Galactic foreground extinction corresponding to a reddening of E_(B-V) =3D 0.02 mag in the direction of the burst (Schlafly & Finkbeiner 2011). We note that our r=E2=80=99- and z=E2=80=99-band magnitudes are consistent with the SDSS catalog magnitudes of the host galaxy (as reported by Malesani et al., GCN #19770). We observed the field of GRB 160804A (Marshall et al., GCN Circular 19761) with the Reionization and Transients Infrared Camera (RATIR; www.ratir.org) on the 1.5m Harold Johnson Telescope at the Observatorio Astron=F3mico Nacional on Sierra San Pedro M=E1rtir from 2016/08 5.16 to 2016/08 5.27 UTC (26.33 to 29.04 hours after the BAT trigger), obtaining a total of 1.78 hours exposure in the r and i bands and 0.75 hours exposure in the Z, Y, J, and H bands. The AMI Large Array triggered on the Swift alert for GRB 160804A (Marshall et al., GCN 19761) as part of the 4pisky program, and subsequent follow up observations were obtained up to 12 days post-burst. Our observations at 15 GHz on 2016 Aug 04.85, Aug 05.75, Aug 07.75, Aug 11.75, and Aug 16.67 (UT) reveal a transient radio source at the XRT location (Osborne et al., GCN 19762), with flux densities of <141 uJy (3sigma), 189+/-46 uJy, 583+/-40 uJy, 292+/-34 uJy, and 168+/-38 uJy respectively.